Each year, areas around the country experience high volumes of rain, causing local rivers, drainage runoff, and streams to fill and overflow. Hurricane Sandy devastated the East Coast with high winds, record storm surges, and pouring rain, leaving entire communities flooded. And folks, House Raising or Home Lifting is the best way to keep you home High and Dry! Structural elevation is a common corrective measure, which is effective in both preventing and/or reducing flood damage. Lifting your home (or business) above the flood level will give your property the added protection that it needs from both storm surges and flood water. Raised homes in high-risk flood areas are also more valuable to prospective buyers, they will sell faster compared to homes that have not been elevated. We have the capability to raise a home anywhere from 6 inches to 16 feet or more, depending on your needs. Regardless of the height, High and Dry will handle your property as if it were our own, ensuring that the job is done properly the first time. 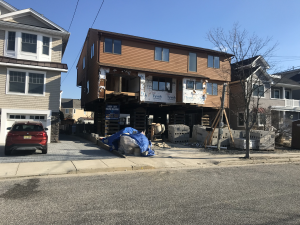 High and Dry House Raising LLC is based in Manasquan, NJ. We are life long NJ residents and live in Manasquan. We have raised our homes as well as our neighbors’ homes, and we hire local people. 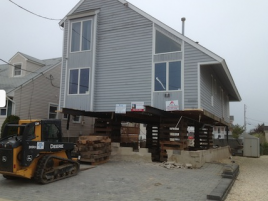 High and Dry helps homeowners all over the New Jersey shore area recover from the devastation of flooding daily.